Almost everyone in the world cherishes diamonds. These beautiful, sparkling stones are considered timeless, eternal and thus, are often presented as a symbol of love that is as everlasting as the beauty and brilliance of a diamond. While all of us share the love for diamonds, not many are aware of the terms associated with diamonds. There is a lot to diamond terminology except the 4Cs of a diamond – colour, clarity, cut and carat. Here are a few terms that will help you understand the language of diamonds, which is helpful in diamond buying and trade. The flat facet on the top of the diamond is called table. It is the largest facet on any cut diamond. The outer edge or outline of a diamond’s shapes is known as its girdle. Most diamond labs grade the thickness of a girdle, and not its appearance. Some popular diamond shapes that come with thick girdles at their points include pear-shaped, marquise-shaped and heart-shaped diamonds. 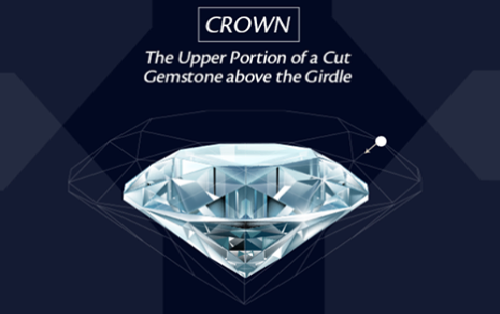 The upper portion of a cut diamond above the girdle is called the crown of a diamond. It consists of a table facet surrounded by either star and bezel or concentric rows of facets reaching from the table to the girdle. The lower portion of a diamond, below the girdle is known as its pavilion. 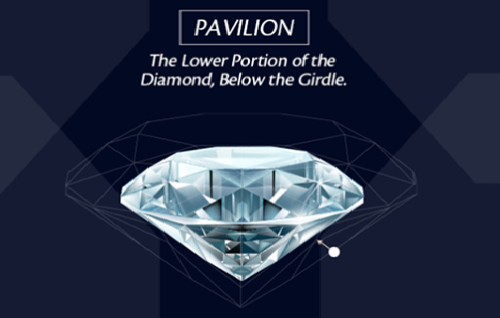 To ensure that a diamond gets its right shape and shine, its pavilion facets are cut uniformly at a proper angle to meet each other at a perfect point. 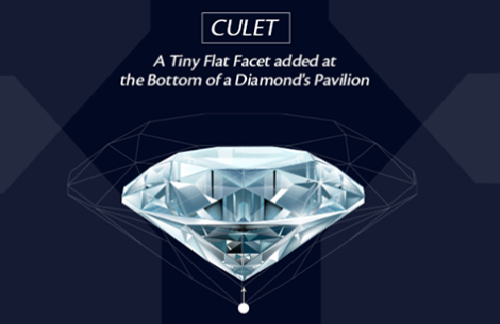 A tiny flat facet added at the bottom of a diamond’s pavilion is called the culet. A culet is added to the diamond to provide sufficient protection to the tip of the pavilion, preventing it from being chipped or damaged. While diamonds are said to be flawless, they aren’t. Any imperfection of the surface of a diamond, whether recognisable or not, is referred to as a blemish. A diamond with the minimum amount of blemishes would cost the most (if you are comparing diamonds with the same colour, carat and cut).